HOME / UPCOMING EVENTS / Guitar N.E.R.D. 3-day-meeting for pop/jazz/rock guitar-teachers at the conservatoires in the Nordic region. The content of the course will be a mix of presentations on specific topics, debates, video presentations followed by a "what's next" discussion, "hands-on" demonstrations, teaching-demonstration-sessions, tips &amp; tricks sharing and "problem-solving"-sessions, and jam-sessions. It is important to remember to actually play together. Always. Also, on a conference like this. 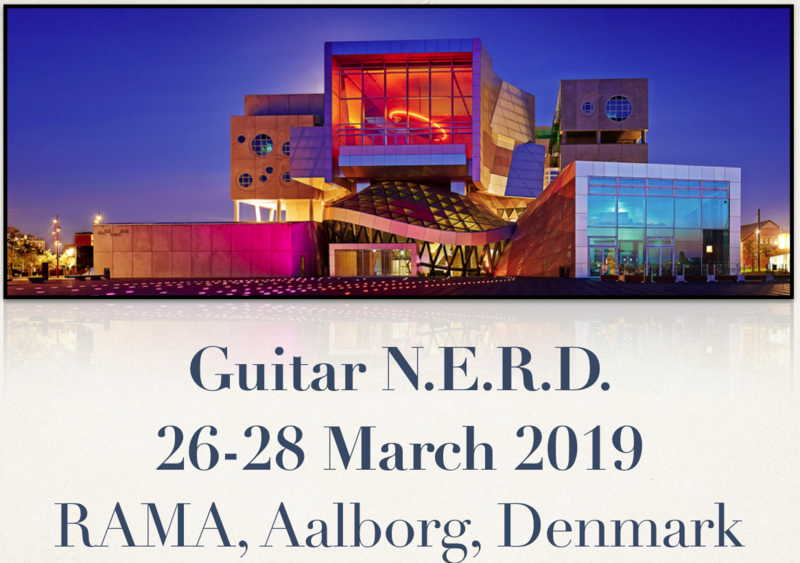 By gathering the best pedagogical practice about guitar-teaching from partner academies in particular and the Nordic and Baltic pedagogical environments in general, the intensive seminar will focus on innovative and broad-based teaching methods. The content will be "user-generated" by the participants, which enables sharing professional competences of guitar teaching practice between the partner institutions. It will be and an excellent opportunity to gather national expertise and competence to achieve international level and a wider scope. The seminar/conference will be hosted at the RAMA's building "Musikkens Hus" in Aalborg,Denmark. 4. Debate: "Gender ... where are the girls??" "What is worth learning - for the student", and how to make the student answer that question. "Diverse approaches in a life with music"
1. Debate on "pedagogical progression" in music schools. How do we prepare out students to their pedagogical work-life. What is needed "out there"
4. Summary of discussions and mindsets. Inputs from the participants to the final written feed-back to the managements and the Nordplusmusic web-site.